Stewman's Lobster Pound in Bar Harbor, Maine. Maine is a sprawling state with several distinct regions. From the rugged, frontier-minded counties of northern Maine to the coastal communities of Bar Harbor, Kennebunkport and Ogunquit, there is as much diversity amongst the people and their lifestyle as there is amongst the type of food culture found there. Maine is best described as a Tale of Two States, and northern Maine’s on-again-off-again desire to secede from its southern half emphasizes this. While northern Maine celebrates the hunting, fishing and trapping lifestyle of its French-Canadian ancestry, Portland and southern Maine are booming with five star restaurants, celebrity chefs, farmer’s markets and artisan products. However, there are pivotal things both regions of Maine agree upon. Blueberries, potatoes, fresh seafood and well-crafted beer will always be the foundation of Maine’s culinary traditions. If Portland is the epicenter of Maine’s foodie culture, then its passion for food and farm to table philosophy has rippled down the coastline. If you are looking for five star restaurants, locovore movements and farm and forage specialty dishes, then Portland and southern Maine is where to go. Cutting-edge chefs are preparing Epicurean flavors and new twists on traditional classics like lobster, quail breast, venison and trout. Do not worry; there is more to Maine than haute cuisine and delicately folded linens. 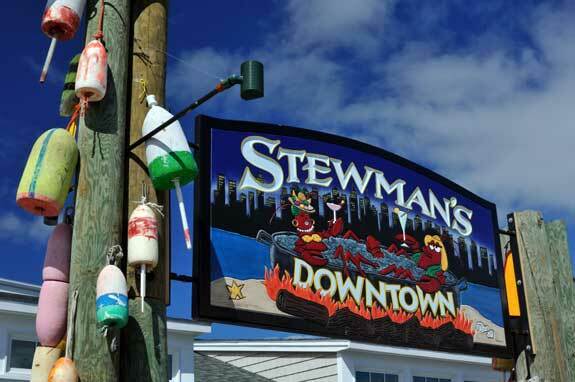 Follow Route 1 or 1A and you will be bombarded with colorful, buoy-strung clam shacks. Everybody has a personal favorite, so just pull over and try one. Whether you want an overflowing basket of mussels drizzled with butter at Joe’s Boathouse, in South Portland, a fresh a haddock sandwich and crispy onion rings, or 2 lbs. of tender lobster meat in an oversized hotdog roll, enjoying the Maine coast, al fresco, is why we come to Vacationland. Be sure to wash it all down with one of Shipyard Brewing Company’s signature beers. They have been brewing in Portland since 1994. From blueberry festivals, preserves and pies to The Atlantic Brewing Company’s famous blueberry beer, the small, dark and tangy Maine blueberry is as ubiquitous as lighthouses are to the rocky coast. When you visit Bar Harbor, in the heart of Downeast Maine, you can not only sample that famous blueberry beer, but also pick up a homemade blueberry pie from one of the many farm stands. However, it is the oysters, scallops and crabs that are the real draw in this one-time summer resort. Just ask Barack Obama. He and his family ate at Stewman’s Lobster Pound when they visited Acadia National Park a few years ago. Meat pies, venison, fresh salmon and potato dishes are popular in northern Maine. Northern Maine takes the food out of the five star restaurant and returns it to the countryside, farmhouse and kitchen. In Aroostook County, you are more likely to get invited to a backyard pig roast than to a formal sit down meal at a restaurant. Food in the north is locally sourced and foraged, but due its remote location there is far less fanfare than in southern Maine. However, if you are an avid foodie, then this Tale of Two States will have you coming back for seconds.